Last weekend I worked on a project idea involving the creative use of stairs in a museum. Stairs and escalators are often not more than a connection between two galleries. There is, however, so much more you can do with them. 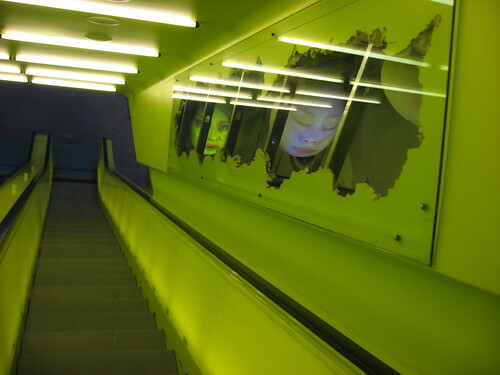 Stairs and escalators are an amazing place to use new media to connect with your audience. Why? Stairs and especially escalators are (with toilets and ticket queues) the only place where your audience will stay a while. They’ll have to go up (or down) anyway, so why not give them something to do or look at in the meantime? Photo by Throughnothing on Flickr. In the Hamilton Building of the Denver Art Museum, a design by Daniel Libeskind, the wonderfully designed stairs are a gallery on their own. From every floor and everywhere in between they offer enticing new angles on the art on display and the building. The experience is difficult to grasp in photos, but a simple Flickr search gives a nice idea. The Ruhrmuseum in Zollverein I visited recently uses stairs and escalators to get visitors in the right mood. First, there’s a long escalator taking you up and into the building. During the long ride up, I completely relaxed and got in the quiet curious mood perfect for visiting a museum. The stairs (designed by Rem Koolhaas) that take you into the galleries are so overwhelming they completely disconnect you from reality. A great starting point to enjoy a museum. The escalator above is in the Tunnel of Light in the Nydalen subway station in Oslo, Norway. I’ve not seen this one in real life, but the videos on YouTube give a pretty good impression. It might be a bit unsettling for a museum, but it takes little imagination to see a similar concept work to convey a more cultural or historical concept. Of course, as a piece of art it has more than enough meaning already. Photo by goldlionpics on Flickr. 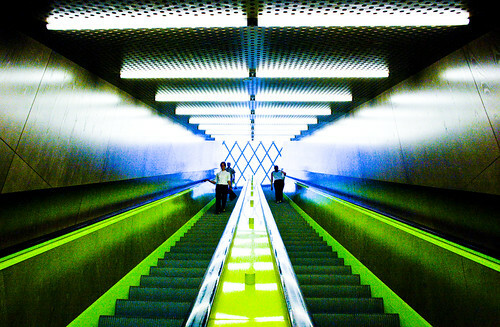 The escalator above is in the Seattle Public Library. There’re ballooning heads on display in the photo. It can be anything, though. Not long ago I had a brainstorm with a group of young museum professionals about how to better engage the audience. One of the unusual ideas was to force people past the exhibitions on an escalator, making sure they spend enough time with the works on display. Not an original thought, given the escalator above. If I missed anything important, please let me know!